[Type text] www.dloc.com Audio Reformatting: 3 Equipment, software, and workflow for this process using a Macintosh running OSX and above and on a Linux machine are explained on the Audacity website: http://manual.audacityteam.org/man/faq.html 2 Analog to Digital Audio Cassette Tape Conversion Equipment: Dual tape cassette deck with noise reduction; microphone input (with recording control); and variable pitch speed control ~$150 $250 (Recommended: TEAC W865R Double Auto Reverse Cassette Deck). Large, over ear headphones (preferable to inear headphones) with or without noise canceling function. ~$20 $150 (Recommended: Grado SR80e Prestige Series He adphones). PC Sound card with support for at least 96kHz/24 bit sampling (Current minimum library best practices) ~$ 50 $300 (Recommended: Creative Labs Sound Blaster Series Sound Card) Audio editing/recording software ~Free $500 (Recommended: Audacity (as above a free program distributed under the GNU GPL) Installation: Connect cassette deck to PC sound card: Connect RCA end of RCA to Mini cable to cassette decks OUTPUT; connect mini end of RCA to Mini cable to PC sound cards line in/mic in port. Sample Workflow (assuming use of Audacity) Recording an audio cassette tape: 1. Turn on cassette deck 2. Insert the tape into the cassette deck and play it, so as to assess its native quality (using headphones). 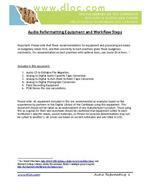 [Type text] www.dloc.com Audio Reformatting: 4 3. Once satisfied, rewind tape and prepare Audacity software for recording. 4. Open Audacity program 5. In main program window, select input device (your sound card) 6. Set sample quality (lower left of main screen) to desired rate (44.1kHz is default, and the highest sampling rate an audio CD can accommodat e; for the purposes of making archival master audio file s, 96kHz is recommended). 7. In order to properly sync the playback device (cassette deck) and Audacity, it may be necessary to begin recording with Audacity by clicking the red RECORD button prior to pr essing play on the cassette deck. Doing so will give you a few seconds of lead in time which will make post processing and editing much easier). a. Click on the red RECORD button in Audacity b. After a few seconds, press play on your playback device. 8. When the tape comes to an end, you may do one of two things: a. Press the yellow STOP button to cease recording, at which point the current track will end. b. Press the blue PAUSE button to pause the recording, which is useful if you need to flip the cassette over to the alternate side, at which point you can begin recording that side on the same track. i. If your cassette deck is equipped with auto reverse, pausing the recording may not be necessary, as the tapes alternate side will begin playing back automatically. 9. When you are finished recording your track, you should save your project (File > Save Project) and either perform post processing/editing, or save it for later. 10. When you are satisfied with your edits, export the track as a WAV or AIFF file (both lossless and unco mpressed [settings for bitrate can be changed in Edit > Preferences]). This should serve as your archival master. From it you can make derivative (lossy) audio files (MP3, WMA, OGG Vorbis) that are smaller in size and compressed, but may act better as onli ne service copies for download and distribution. Further information from Audacitys wiki on c onversion and editing: http://manual.audacityteam.org/man/faq.html 3 Analog to Digital Inch (Reel to Reel) Tape Conversion Equipment: inch tape two track analog recorder/player (reelto reel), with pitch control, RCA output, headphone jack ~Prices vary. Only a handful of companies still manufacture inch reel to reel players/recorders (Otari, Inc., Nagra), and at very high prices. It might be easier to ac quire an older player/recorder at less cost, most of which are fairly reliable. [Type text] www.dloc.com Audio Reformatting: 5 (Recommended: TEAC TASCAM 32 a popular pro series model with a strong reputation of reliability) Large, over ear headphones (preferable to inear headphones) with or without noise canceling function; 1/8 inch to inch adapter ~$20 $150 Recommended: Grado SR80e Prestige Series Headphones. PC Sound card with support for 96kHz/24 bit sampling ~$50 $300 (Recommended: Creative Labs Sound Blaster Series sound card). Audio editing/recording software ~Free $500 Recommended: Audacity, a free program distributed under the GNU GPL) Installation: Connect reelto reel player to PC sound card: Connect RCA end of RCA to Mini cable to player/recorders OUTPUT; connect mini end of RCA to Mini cable to PC sound cards line in/mic in port. Sample Workflow (assuming use of Audacity) Recording a 1/4 inch tape: 1. Turn on player/recorder. 2. Load tape spool onto left side of player/recorder (loading directions may not consistent across all legacy player/recorders) play it, so as to assess its native quality (using headphones). 3. Once satisfied, rewind tape and prepare Audacity software for recording. 4. Open Audacity program 5. In main program window, select input device (your sound card) 6. Set sample quality (lower left of main screen) to desired rate (44.1kH z is default, and the highest sampling rate an audio CD can accommodate; for the purposes of making archival masters, 96kHz is recommended). 7. In order to properly sync the playback device ( reel to reel) and Audacity, it may be necessary to begin recording w ith Audacity by clicking the red RECORD button prior to pressing play on the cassette deck. Doing so will give you a few seconds of leadin time which will make post processing and editing much easier). a. Click on the red RECORD button in Audacity b. After a fe w seconds, press play on your playback device. [Type text] www.dloc.com Audio Reformatting: 9 Formula : Bits per sample x samples per second = bits per second x 2 channels = bits per second of stereo / 8 = Bytes per second of stereo x 60 seconds = Bytes per minute of stereo x 60 minutes = Bytes per hour of stereo. 24 bit, 96KHz, Stereo : [576 KB per second; 34.56 MB per minute; 2.07 GB per hour] 24 bits pe r sample x 96,000 samples per second = 2,304,000 bits per second x 2 channels = 4,608,000 bits per second of stereo. 4,608,000 bits per second / 8 = 576,000 Bytes per second x 60 seconds = 34,560,000 Bytes or 34.56 MB per minute of stereo. 34.56 MB per minute of stereo x 60 minutes = 2.07 GB per hour of stereo.